A position-by-position review of how the Eagles’ offense performed against the Jaguars, with extensive notes on Jason Peters and the line. Here are 10 things we’ll be tracking Saturday night when the Eagles take on the Jaguars. Chip Kelly and the Eagles introduced a four tight end package Thursday night against the Panthers. We take a look at why it was successful for them. The Eagles were dealt their first big blow of the summer, losing Jeremy Maclin for the season with a torn ACL injury Saturday. Entering the final year of his deal, Maclin was committed to proving his worth on the field this offseason. Instead, Maclin faces surgery and a grueling rehab regimen away from his teammates in the months ahead. In the past three seasons, Maclin has averaged 67 catches, 893 yards and seven touchdowns. So how will the Eagles replace that production in 2013? Here’s a look at their current options on the roster. James Casey lined up with his hand on the ground, waited for the imaginary snap, exploded out of his stance and started into his pass route. 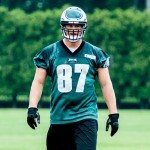 This was last Thursday, a full week before the Eagles’ new tight end was required to be at the NovaCare Complex. But there he was, all by himself on the practice field on the hottest day of summer (98 degrees). 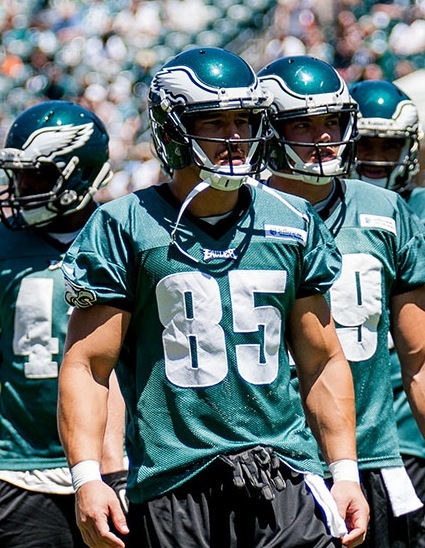 When the Eagles signed Casey back in March, Chip Kelly referred to him as a tempo-setter. And this is exactly what he was talking about. Casey doesn’t seem to care much for the offseason. Entering his fifth year in the league, he has developed a routine: show up to the facility three weeks before camp starts, get settled and be one of the players to set the tone when everybody else shows up. 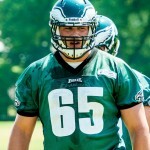 On Tuesday, when Eagles’ rookies practiced for the first time, the only veterans in attendance (other than the quarterbacks) were Casey and Jason Kelce. A Chip Kelly/Jimmy Johnson comparison from Peter King and more in this week’s national media roundup. While on vacation, I was able to comb back over The Essential Smart Football by Chris B. Brown. Many of you are familiar with Brown from his Web site and his work on Grantland. If you haven’t checked out the book yet, I highly recommend doing so in the next couple months leading up to the season. 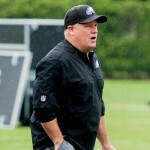 Brown has written extensively on Chip Kelly in the past, so it should come as no surprise that many of the concepts he tackles in his book apply to the 2013 Eagles. Below are some thoughts on four specific concepts that stood out to me. From two tight end sets to the state of the offensive line to the quarterback competition, here are three things we learned about the Eagles’ offense this spring. We went over the defense yesterday. Here is the projected depth chart for the Eagles’ offense, based on what we saw during spring practices. Explanations below. 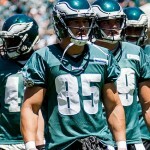 Our depth chart series continues with a look at Brent Celek, Zach Ertz, James Casey and the tight ends. You might remember Chip Kelly‘s entertaining response to the tight end question back in April, when he was asked to explain how he can make it work with Brent Celek, James Casey and Zach Ertz all vying for playing time. “Yeah. You go like that (holds three fingers in the air) and three tight ends go in the game,” he said. That’s why Kelly values tight ends so much: they create matchup problems. But in order to capitalize on those matchup advantages, the ends have to be able to successfully “smash” the opposition as a blocker in one moment and create in the passing game the next. That is the challenge that faces this group in Year One under Kelly. 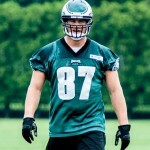 Eagles tight end James Casey underwent arthroscopic knee surgery earlier this week and is out for the remainder of the spring, the team confirmed. The procedure was done to clean out loose cartilage in his right knee. Casey should be ready for training camp. 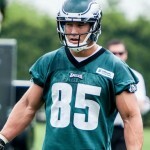 The Eagles’ first free-agent signing was fullback/H-Back/tight end James Casey from the Texans. Casey has not put up eye-popping numbers in his first four seasons in the league: 66 catches for 752 yards and four touchdowns. So why did Chip Kelly target him? Here’s a look with the All-22. The Eagles are drawing praise for their moves in free agency. Here’s a roundup of what the national media are saying about the Birds. 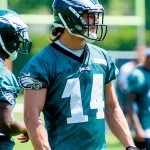 Chip Kelly was asked about James Casey’s versatility when he brought up an interesting name. “I think the versatility that you can present to defenses is when you have a certain grouping in the game, there’s not only one thing you can do,” Kelly said. “I think the teams that have been successful doing it, you watch the Patriots line up Aaron Hernandez all over the place. Is he going to be a tight end? Is he going to be a receiver? Is he going to be a running back? That was really all Kelly needed to say to explain why he thinks Casey is such a good fit.